In our last session, we saw the relationship between GDP and Health as an indicator of quality of living. To recall the most important fact, the higher the GDP of a nation is, the greater is the possibility of that nation setting aside more money to promoting health of the citizens of the country. We also noted that the more healthy persons a nation has, the more is the possibility that the performance of the nation will be better and more efficient than the nation of the people with poor health. So, the question is: how to provide healthy citizens to the nation and whose obligation is that? A nation can create situations where health-issues are attended to with care; it can even give some money for it. But a nation cannot decide on behalf of the individuals who are suffering. The implication is health is the final responsibility of the individual who must decide to be healthy. And what is the situation that helps the individual learn healthy living, a situation where learning is very pleasant and spontaneous? The situation is nothing other than the family dinner; that is, all the members of the family take their food together, at least once in a day. The practice of eating as a family has great advantages of lasting value, for all the members of the family, the parents and the children. Children learn everything, from ordinary social manners like saying �Thank You� to significant fact of personality, broadly, whether optimistic or pessimistic. The adulthood of the children is moulded by the examples of the parents the children see, particularly at the dining table. Research has shown that family mealtimes help children in many ways and one of the most important of them is their food choices. In other words, nutrition gets more attention from children who have family mealtimes. 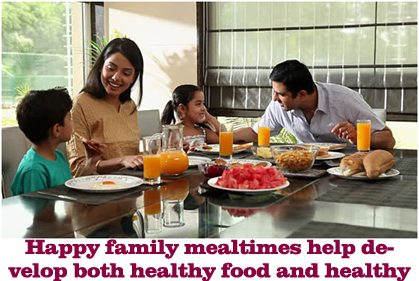 Family mealtimes have lots of benefits to the family members. First, you spend more meaningful time with the children; it means you come to know more about them since you share your experiences and ask your children to share their experiences in school. This practice tends to continue throughout and children when grown adults , they tend to share their difficulties also with you. In short, the parents become their most trusted companions and they know parents are there behind them in any crisis. This gives them courage to face and live life at any stage. And confident individuals often turn out to be efficient in anything they do. This means a nation of more happy families will have more efficient people to employ and to develop the economy of the country. It is really exciting to note that a happy family is a source of efficient employees or employers and what else a country needs to develop its GDP? Having seen the relationship between Health and GDP, considering health as an indicator of quality living as implied and indicated by GDP, we shall take up some other aspect of quality living in association with GDP. Remember to ask me questions which I will try to answer to the best of my experience and knowledge.